﻿ Best Price on Blue Banyan Inn in Naranjito + Reviews! Featuring a sun terrace with swimming pool, an extensive garden and free breakfast, the Blue Banyan Inn is located 20 minutes’ drive from Quepos town center and 6.2 mi from the local airport. The luxury cottages with rustic décor offer air conditioning, ceiling fan, seating area and a furnished terrace with garden and mountain views. All are equipped with a TV and DVD player, while the bathrooms come with free toiletries. This self-sustainable property has a common dining area where guests can enjoy their free breakfast. Free Wi-Fi is available in public areas. Tours to the on-site monkey sanctuary can be arranged at Blue Banyan Inn, as well activities such as canopy tours, rafting, hiking, sport fishing and snorkeling. 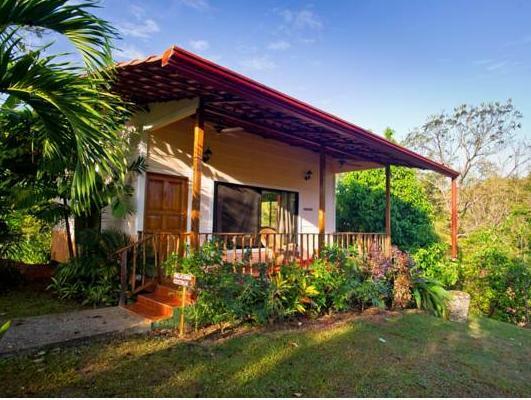 This eco-friendly property is within 30 minutes’ drive of Manuel Antonio National Park and a 1-hour drive from Herradura Beach and Jaco Beach. Juan Santamaría International Airport is 2 hours’ drive away. Please note that the property recommends that the guest provides their own transportation. The property can arrange alternate transportation through rental cars or taxis and vans.